Exercise is an important way to boost bodily functions, improve physical fitness, and even lose weight. A great but simple exercise that provides many benefits for several parts of the body is a dumbbell swing (a.k.a. kettlebell swing). Doing the same exercises all the time can help your muscles grow, giving you a lean body. This exercise comes in all shapes and sizes, and in this article, we will look at the ins and outs of this exercise to give you the most information possible. There are several benefits to performing dumbbell swing exercises on a regular basis. In fact, these dumbbell swing benefits are so great that many people use this exercise regularly. Dumbbell swings are an interesting exercise. They combine the use of weights with a movement to harness energy and power to boost muscle function in several locations. If you are performing the exercise with the right stance and technique, you are going to target several different muscle groups. First, you’re going to work out your arms. This is a no-brainer since you are using your arms to hold the dumbbell for the exercise. Two, you’re going to be working out your shoulders, upper back, and chest since the momentum and swing uses your shoulders for support and your upper back and chest to keep the momentum going. Three, you’re going to work out your legs. The exercise is going to place you in a slight forward bend. As you perform the swing, you will stand all the way up and push your hips forward like a deadlift. This will work out your legs as well as a big of your glutes and hips. Finally, you’re going to work your core. This might not be as pronounced as the other exercises, but to stay stable as you exercise, you need to engage your core. When you engage your core, you are building muscle there. Remember to keep your back straight to avoid injury in the lower back. When performing dumbbell swings, you need to ensure that you are doing everything you can to remain safe. Just with any exercise involving weights, you need to listen to your body. If something doesn’t feel right, stop the exercise, check your technique, and make sure you are performing the exercise right. If you try again and things still feel off, you might want to rethink your weight size or the exercise all together. Remember, it is important to always exercise caution when working out with weights. If you experience any different pain in weird places, contact your doctor to ensure there are no injuries. Remember to stretch before your exercise and cool down after to provide you with a safe dumbbell workout experience. Most often people use kettle bells for their swings, which is perfectly fine. However, dumbbells can provide different challenges for the swings, especially when it comes to performing the exercise in general. To perform a kettlebell swing with dumbbell, you need to first hold the dumbbell by the end plate to get a proper swing. Make sure you have both hands on the plate for security. Next, begin the exercise by standing with your feet hip-width apart. Begin standing upright, pulling the dumbbell up to your shoulder height. Using your momentum, swing the dumbbell down and between your legs, making sure to keep your back straight to avoid any injuries. You can repeat this exercise with your dumbbell for as many reps as you desire. You can also vary up the weight size, depending on what you are comfortable holding. If you have never done a kettlebell swing with a dumbbell before, it might take some getting used to. A traditional swing exercise is going to use two hands to get the momentum going. But with the dumbbell one arm swing (a.k.a the single arm kettlebell swing), you can gain more power and muscle in the lower body as well as your arm. Start by standing with your feet hip-width apart. Square your shoulders, and grasp the dumbbell in one hand. Pull it up to shoulder level, and swing it back with control, squatting as you swing it back. This helps give you more endurance, and it boosts muscle in your working arm. After doing your desired reps, swap hands to ensure you are getting a full workout on both sides. Just like with the kettlebell swing, you can alternate between using a kettlebell or dumbbell for this workout, though dumbbells are easier to hold for this swing type. Instead of the traditional one dumbbell used for a traditional swing, the dumbbell skier swing uses two dumbbells to resemble the ski sticks used in the sport. Start as you normally would with your feet hip-width apart. Raise both dumbbells to shoulder height, take a breath, engage your core, and swing both dumbbells back behind you, bending forward slightly. Use your momentum to back up straight, pushing your hips forward a bit to work the glutes. Complete your desired reps for best results. 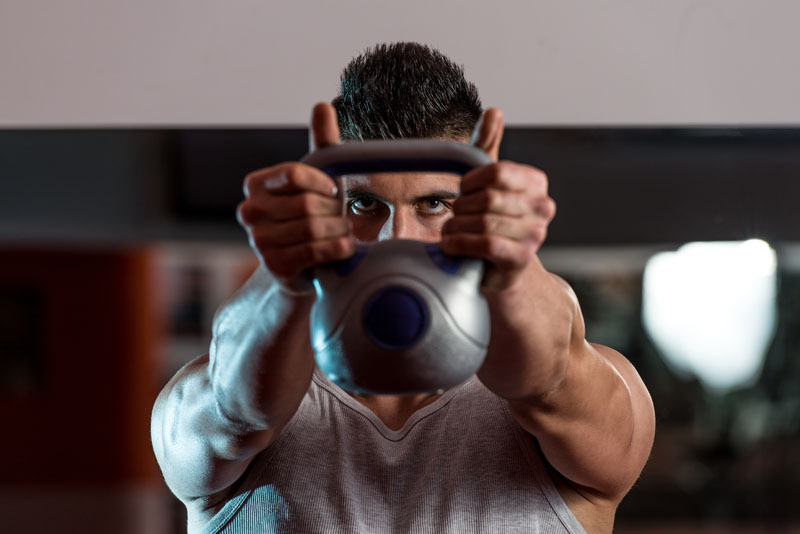 You can always substitute a kettlebell for your dumbbell, though for the skier swings, dumbbells tend to be easier to hold since you weight either side of the gripping point. When it comes to working out, getting in shape, or losing weight, one exercise that is ideal for your body is dumbbell or kettlebell swings. These swings can be done in a variety of ways, but they are both efficient and ideal for boosting several benefits in your body. Remember to get the right stance and keep your lower back straight during the workout. Stretching and doing a proper warm-up before the exercise can prevent muscle tears and any injuries that might occur. You should always listen to your body, and if it doesn’t feel right, modify. Conditioning with dumbbells is a great way to boost muscle, improve your body functions, and more.